At Grace, we know that kids are not only the future of the church but also a huge part of the present. During each service, we provide a fully staffed nursery for newborns all the way to years old. Our desire is that our kids are connected to Jesus and that they have people in their lives that can share God's love and grace with them. Below is just some of the ways that we strive to connect our kids. On Sunday mornings at 9:45 a.m., we have Sunday School for 3 years to 5th graders. We provide classes of varying ages to help them grow in the Lord. Our Sunday School teachers are passionate about helping our kids learn about Jesus. On Sunday mornings, during worship beginning at 10:50 a.m., we provide a couple of different options for kids based on their ages. is a worship service designed specifically for ages 3-6.
is designed for ages 7-12. On Sunday nights at 5 p.m., we have quiz practice for those involved. This is a great opportunity for our kids to learn to hide God's Word in their hearts. 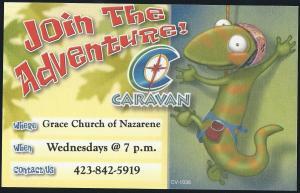 Wednesdays, we have a special opportunity for our kids as they participate in caravan. Have questions? Please feel free to contact us or come by and see us!